فراگیرشدن پیامک و استقبال روزافزون از این رسانه در جهان، بستر مناسبی را برای تبلیغ کالاها و خدمات و ایجاد رابطه‌ مستقیم بازاریابان و مصرف‌کنندگان نهایی، بدون محدودیت‌های زمانی و مکانی فراهم آورده‌ است. از این رو، پژوهش حاضر، با هدف افزایش ارزش تبلیغی و اثربخشی این رسانه نوین تبلیغاتی، به دنبال شناسایی عوامل کاهش‌دهنده آزاردهندگی پیامک‌های تبلیغی برای کاربران تلفن همراه بوده است. برای این منظور، مدلی متشکل از چهار عامل مؤثر بر کاهش آزاردهندگی پیامک‌های تبلیغاتی: ربط شخصی، اعتبار منبع، کسب اجازه و تواتر ارسال، طراحی شده است. این پژوهش به روش ‌آزمایشی و از طریق ارسال پیامک و پیمایش از 240 نفر از کاربران تلفن همراه در ایران انجام گرفته است. نتایج بیانگر آن است که به غیر از تواتر ارسال، سه عامل دیگر یعنی ربط‌ شخصی، کسب اجازه و اعتبار منبع تأثیر قابل توجهی بر کاهش آزاردهندگی پیامک‌های تبلیغاتی دارند. همچنین میزان ارزش تبلیغی پیامک‌های تبلیغاتی از دیدگاه کاربران پایین است. 2Associate prof. in Media Psychology, Allameh Tabataba’ee Uni. Short Message Service’s (SMS) worldwide spread and its increasing popularity has created a suitable ground for advertising goods and services and linking market directly to the final consumers without any constraints in terms of time and location. The present research aims to add to the advertising and effectiveness value of this modern medium of advertising and identify factors reducing bothering components of Mobile advertisement for cell phone users. A model consisting of four factors affecting the disruptive aspects of promotional ads, i.e. personal relevance, source credibility, permission and frequency of exposure, is proposed. This study was carried out on a pilot basis through a survey of 240 cell phone users in Iran who were sent messages by the researcher. The findings indicate that, except for the “frequency of exposure”, the other three factors had a significant effect on reducing the bothering aspect of promotional cell phone short messages. Furthermore, the advertising value of advertising messages was low before users. حکیم آرا، محمدعلی. (1384). ارتباطات متقاعد گرانه و تبلیغ. تهران: سمت. سیاوشی، ملیحه و عابدین، بهاره. (1388). بررسی نگرش و عکس‌العمل افراد نسبت به دریافت پیامک‌های تبلیغاتی در عصر فناوری اطلاعات و ارتباطات. 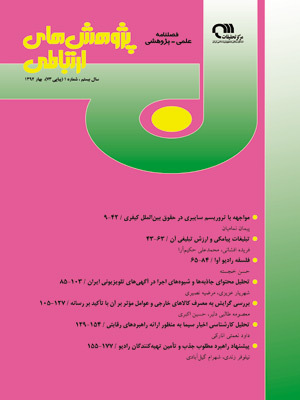 فصلنامهمدیریتفناوری اطلاعات، 1 (3)، صص 68ـ53. مؤمنی، مینو. (۱۳۸۶). وسوسه SMS، پیام کوتاه به رسانه‌ای فراگیر تبدیل شده است. هفته‌نامه شهروند امروز، ۳۱، ویژه نوروز. Aaker, D.A. & Bruzzone, DE. (1985). Causes of Irritation in Advertising. Journal of Marketing, Vol. 49, pp. 47-57. Al-alak, B. & Alnawas, I. (2010). Mobile Marketing: Examining the Impact of Trust, Privacy Concern and Consumers' Attitudes on Intention to Purchase. International Journal of Business and Management, Vol. 5, No. 3. Bamba, F. & Barnes, S. (2007). SMS advertising , permission and consumer: A Study, Business Process Management Journal, Vol. 13, ISSUE 6, pp. 815-829. Barwise, P. & Strong, C. (2002). Permission-Based Mobile Advertising. Journal of Interactive Marketing. Vol. 16, No. 1, pp. 14-24. Biswas, A. & Thota, S.C. (2003). The Effect of Irrelevant Information on Consumer Irritation and Attitudes: the Moderating Role of Need to Evaluate, in Forthcoming Advances in Consumer Research. Association for Consumer Research,Vol. 31. Brackett, L.K. & B. Carr, N. (2001). Cyberspace Advertising vs. Other Media: Consumer vs. Mature Student Attitudes. Journal of Advertising Research, Vol. 41, No. 5, pp. 23-32. Ducoffe, R. H. (1996). Advertising Value and Advertising on the Web. Journal of Advertising Research, Vol. 36, pp. 21-36. Ducoffe, R.H. (1995). How Consumers Assess the Value of Advertising. Journal of Current Issues and Research in Advertising, pp.1-18. Edwards, S.M. & Li, H. & Lee, J.H. (2002). Forced Exposure and Psychological Reactance: Antecedents and Consequences of the Perceived Intrusiveness of Pop-Up Ads. Journal of Advertising, Vol. 31, No. 3, pp. 83-95. Jingjun Xu, D. (2007). The Influence of Personalization in Affecting Consumer Attitudes Toward Mobile Advertising in China. The Journal of Computer Information Systems; pp. 9-19. Kearney, A.T. (2002). Mobinet Index, No. 5. Chicago: A.T. Kearney and Cambridge University. Leppaniemi, M. & Karjaluoto, H. (2005). Factors Influencing Consumers’ Willingness to Accept Mobile Advertising: a Conceptual Model. International Journal of Mobile Communications, Vol. 3, No. 3, pp. 197–213. MacKenzie S. & Lutz, J. (1989). An Empirical Examination of the Structural Antecedents of Attitude Toward the Ad in an Advertising Pretesting Context. Journal of Marketing, Vol. 53, pp. 48-65. Maneesoonthern, C. & Fortin, D. (2004). An Exploration of Texting Behaviorand Attitudes TowardPermission-Based Advertising in New Zealand,University of Canterbury. Meyvis, T. & Janiszewski, C. (2002). Consumers’Beliefs About Product Benefits: The Effect of Obviously Irrelevant Product Information. Journal of ConsumerResearch, 28 (March), pp. 618-635. Rettie, R. & Brum, M. (2001). M-Commerce: The Role of SMS Text Messages, COTIM. Rittippant & et al. (2009). Consumers’ Perception of the Effectiveness of Short Message Service (SMS) and Multimedia Message Service (MMS) as Marketing Tools. World Academy of Science, Engineering and Technology. Vol. 53, pp. 815-821. Satyanarayanan, M. (2005). SwissArmy Knife or Wallet?, IEEE Pervasive Computing, pp. 2- 3. Tezinde, T.; Smith, B. & Murphy, J. (2002). Getting permission: Exploring Factors Affecting Permission Marketing. Journal of Interactive Marketing, Vol. 16, No. 4, pp. 28-36. Tsang, M.S. Ho. & Liang, T. (2004). Consumer Attitudes toward Mobile Advertising: An Empirical Study. International Journal of Electronic Commerce, Vol. 8, No. 3, pp.65-78. Wehmeyer, K. (2007). Mobile Ad Intrusiveness - The Effects of Message Type and Situation, 20th Bled eConference eMergence: Merging and Emerging Technologies, Processes and Institutions, pp. 758-775.